Abortion is a serious and final choice in a pregnancy. You should not make this decision in a hurry. Take the time to educate yourself. Our peer counselors will discuss the procedure and answer any questions you may have. Following an abortion some women experience intense emotions that linger (guilt, difficulty sleeping, depression, anxiety around the anniversary of the abortion each year). 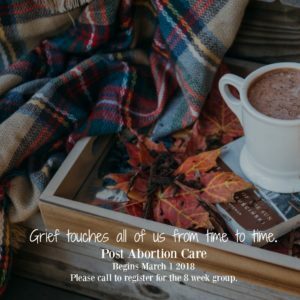 We are here to help, with post-abortion support groups, grief recovery and one on one peer counselling. All services are free and confidential. Support Groups are available throughout the year. Please call to register 250-334-0058.